Di Smith's role at Northwestern is to support nursing department faculty and students by setting up labs and equipment, ordering medical supplies, and running and maintaining the human patient simulators. She is a registered nurse with more than 20 years of experience in hospital and specialty care clinic settings. She is also skilled with electronic medical records. 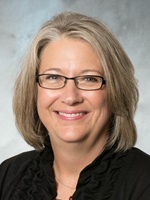 Prior to joining Northwestern's staff, Smith worked for Pulmonary & Sleep Consultants, Sanford Health, and Avera Medical Oncology & Hematology, all in Sioux Falls, S.D. She is a graduate of South Dakota State University, where she earned a Bachelor of Science in Nursing degree.